"that doesn't require me to have years of shooting and technical experience"
"that doesn't cost too much". Obviously, the Internet offers some of these learning opportunities. Even sites that are primarily driven by a more technically oriented membership have sections devoted to beginning photographers. One such site is dpreview.com. Among the many forums hosted by DPREVIEW is an area devoted to "Beginner's Questions". What's most appealing about this forum is the willingness of the most experienced photographers to share their knowledge. Having followed this forum for many years, I have observed that there has been no question left ignored, unanswered or considered too basic. In fact, if you post a question on this forum you are likely to receive dozens of comments/replies within the first few hours. As much as I admire these Internet educational sites and the service they perform, they (including this blog) are no substitute for hands-on guidance in photography. So I would like to offer some suggestions that provide the beginning photographer with live and in-person opportunities for a more personal photographic learning experience. Virtually every community has at least one camera club. Camera club meetings can occur once or twice each month and the membership usually includes all levels of photographic experience -- beginner to professional. Membership fees are nominal, but well worth the investment. Since these organizations were established to foster and nurture photography, they are designed to cater to the needs of the new photographer. Most importantly everyone at a club meeting shares your love of photography and insatiable appetite to learn more. A large portion of these local camera clubs belong to regional organizations called Councils. 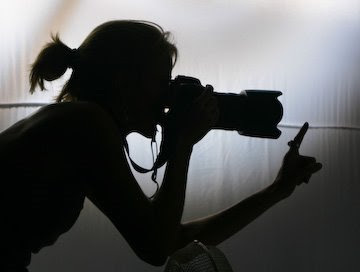 These Councils coordinate group activities, newsletters, educational seminars and photo competitions that individual camera clubs alone could not afford to develop or manage. If you enter, "camera club councils" into Google, you will likely find a Council that covers your location. The council websites contain a list of member clubs in your area as well as the contact information. Here's one such Council that I have grown to admire over the years for the activities and information they provide their member clubs -- The New England Camera Club Council. The NECCC covers the northeast U.S. and conducts one of the largest and most anticipated yearly conventions and educational events in the country. Take a look at the NECCC to get a flavor for what a camera club membership can mean for you. You might also consider joining the Photographic Society of America. PSA is the mother organization for camera club Councils. PSA has an entire program specifically focused on the new member/new photographer. Their website is a collection of the best ideas and educational opportunities available. Member galleries afford you the opportunity to explore the work of other serious amateurs and learn from their experiences. The most frequently overlooked educational opportunity is in everyone's backyard -- your local community colleges. These institutions routinely offer credit and non-credit classes that range from basic to advanced photography subject matter. In many cases, the teachers are area working photographers who know your location and are a part of your community. These classes not only bring together photographers of similar skill levels, but people who are your neighbors. Fellow students can become lifelong friends and an "ever present" local resource of photographic knowledge. Community colleges may be the home of "user-friendly education" because students attending these adult education classes all share a similar passion and skill level ... and are all seeking the same answers. I recently ran a Google search on "community college, photography" and received 2.26 million hits. Statistically speaking there's a high probability that you have a community college option in your area. The cost of a 6 to 10 week basic photography course is usually in the same range as membership in a camera club. Several well respected private photographic workshops are available around the country. Nearly every one of these workshops is situated in a picturesque location. Again the range of student photographic expertise varies. These workshops make a business of developing and offering sessions that are geared to all levels of experience. These workshops also represent the most expensive learning option. That said, it's money well spent. I have always considered workshops to be exciting photographic vacations. Viewed as a major vacation event, workshops are no more expensive than any other week-long vacation you might be contemplating. More importantly, the educators at these sessions are among the most respected photographers of our time. Spending a week with one of these photographic luminaries and fellow photographers in a small, focused class environment is a once-in-a-lifetime experience that is well worth saving your money to attend. The Santa Fe Workshop - Located in Santa Fe, New Mexico. 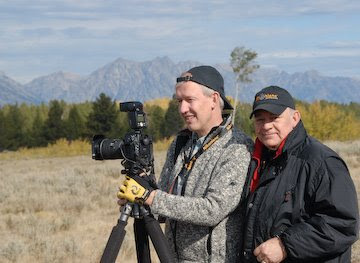 The director of the Santa Fe Workshop works tirelessly to ensure each year's selection of classes contains a who's who of respected photographic instructors, and that each session is packed with hands-on learning and personal critiquing opportunities. 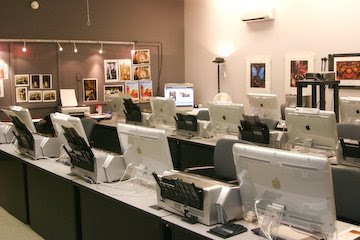 A complete digital darkroom is available as well as exposure to the latest photographic equipment. Sessions are conducted throughout the year. 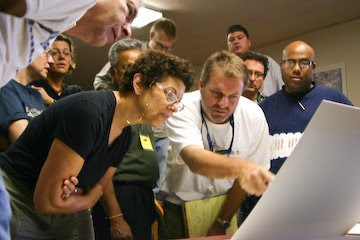 Attending a Santa Fe Workshop week-long session should be on your "Bucket List". The Nikonians - Providing seminars and shooting events throughout the U.S. and Europe. The Nikonians is an independent organization for Nikon DSLR owners of ALL skill levels. Most Nikonian seminars are one or two day events that take place across the country. 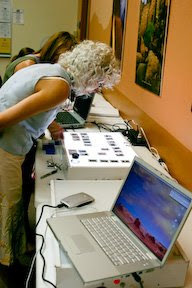 In addition, the Nikonians offer frequent guided photographic expeditions to some of the most photographic areas of the U.S.
Santa Fe Workshop's fully equipped digital darkroom provides students the experience of using and learning on the latest in imaging technology. Most successful, customer-focused camera shops understand the PR and financial advantages that photo classes provide their businesses. So check your area camera shop for a list of upcoming classes. Most of these seminars are short (one day or less) and range from free to a very small admission charge -- a real bargain. 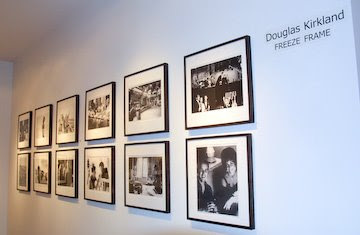 Exhibits of the works of today's master photographers (like this Douglas Kirkland exhibit) travel to special events and galleries all over the country. Nearly every community features photographic exhibits throughout the year. Venues include established art galleries to county fairs and from libraries to camera shops. Spotlighted photographers can be local, national or international. Take every opportunity to visit photographic exhibits. Learn from the work of others. You'll likely find a style and subject matter that's in tune with your personal taste. Learning from the works of others is certainly the highest form of flattery and provides beginning direction to your own photography. Trade shows are prime locations for seeing the latest photo technologies and learning from the manufacturers' experts. 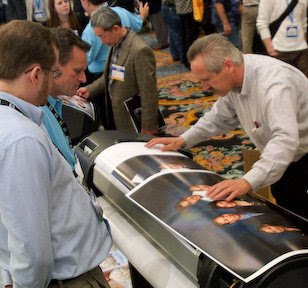 If you want to be overwhelmed with the latest information and technology, attend a photo-specific convention that includes manufacturer booths/exhibits. Naturally, the manufacturers' goal for participating in these trade shows is to SELL. However, you are guaranteed to find the best photographic experts from each company at these shows. They are especially sensitive to the beginning photographer and accustomed to answering the most basic to the most technical questions. And, best of all, you get to play with the newest equipment and technology. It's definitely an educational and "wish list" opportunity. High on the list of "must attend" trade shows for photographers is Photo Plus Expo held at the Javits Center in New York City each October. PPE brings virtually every photo manufacturer together to display their wares. 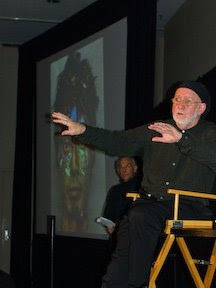 You'll find some of the most prestigious photographers on the planet conducting on-site seminars and exhibiting their art. New York is, without a doubt, the center of the photographic world, so expect to be one of about 60,000 attendees while enjoying a fantastic photography adventure. I include this classification to remind every beginning DSLR user that real learning takes place every time you pick up your camera. I learn something nearly every time I shoot a picture. It's these personal occasions that allow me to experiment with the lessons I have learned from any of the above events. There's no better teacher than experience. The more you shoot, the more you learn. Take notes when you shoot, and download/review every picture. So the answer to the question is: There's a world of hands-on photographic learning opportunities for the beginning photographer. And, there is always something happening near you. I hope you are able to experience a few of these educational events. It's all part of the fun of your new-found art form.